What: Sarah Simmons made her name with the Southern-style meals she created at pop-up City Grit, and her new restaurant Birds & Bubbles covers much of the same territory—with an emphasis (as the name might suggest) on fried chicken and Champagne. We like a woman who knows what she loves. 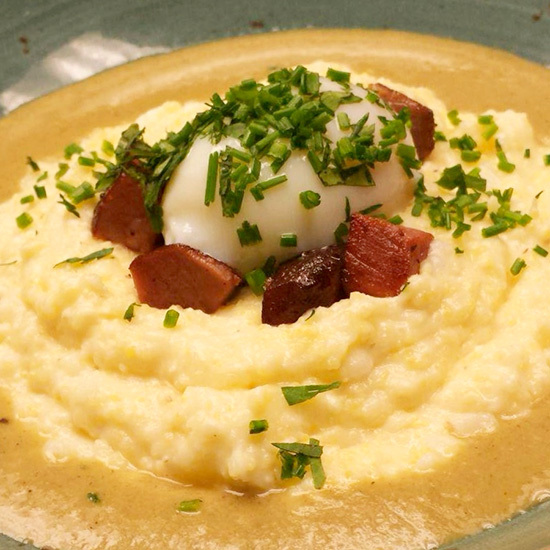 On the brunch menu, trust in the Green Eggs & Ham to erase any memories of too many bubbles the night before— pozole verde, a green hominy-based Mexican stew, with grits, tasso ham, and a soft-boiled egg. A little spicy, a little meaty, comfort food all the way. Wash it down with: Unsurprisingly, there's an impressive menu of sparkling wine to work your way through and plenty of cocktails that showcase it. Try the hibiscus, raspberry, the orange & basil cordials with bubbles or the boozier bourbon-Curaçao-champagne Seelbach.